A last minute, late night giftwrap started a streak of papercuttings. 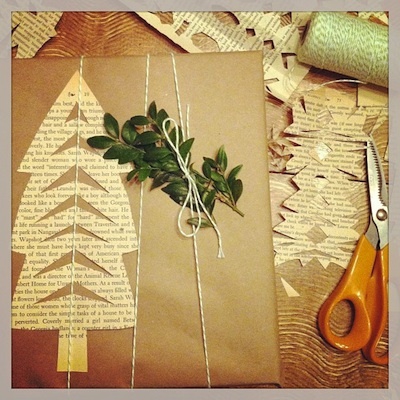 One of my favorite crafts, I always have an old book ready to cut up. The book was apparently closer than the papercutting scissors. Snip, snip, I cut out the giftwrap tree with the kitchen shears. And just kept going, threading the cut-outs and suspending them over the table. I made some floating birds with folded wings on sewing thread hangers. 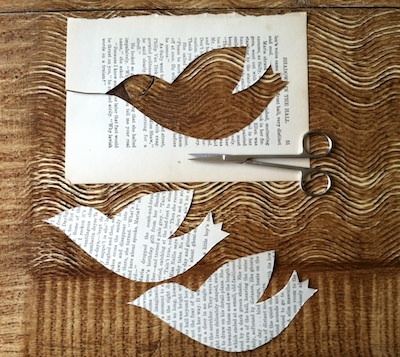 With two pieces of book paper stacked, I cut out 2 birds at once. I knotted a long length of sewing thread and set it aside. Added a swoop of gluestick along the lower part of the bird from the beak to the beginning of the tail. Not on the wings or the tip of the tail. I placed the knotted thread on the gluey paper close to the middle. Layer the second bird on top of the first, pinching it gently right around the thread knot to be sure it's secure. Fold the unglued wings very slightly, adjust the way it hangs and make a hanging loop at the top of the thread. You will have to fiddle with the thread to be sure it hangs correctly. Suspend it over a heat source like a radiator (but not a flame). The rising heat makes it flutter and fly. You could do the same with an angel cut-out. And they do look so pretty on a simple brown paper gift.